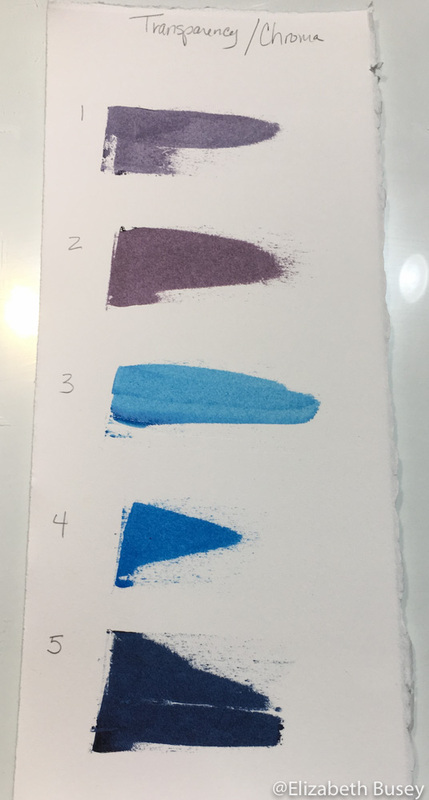 Why are some inks more opaque than others? 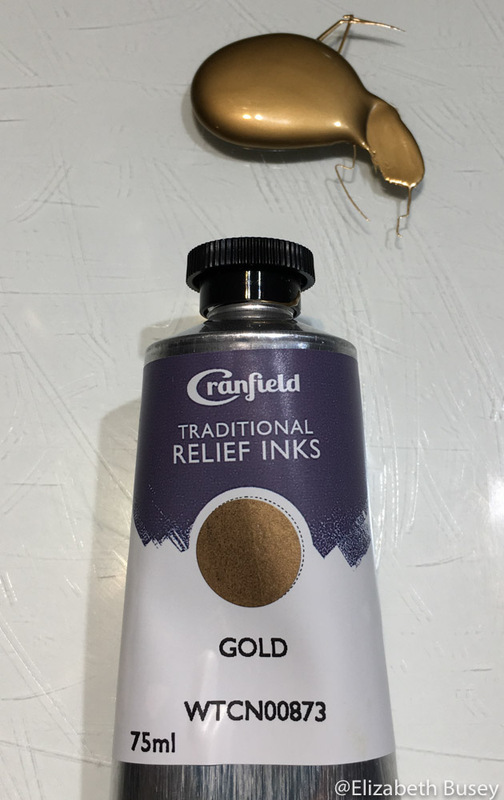 Gamblin’s Relief Ink Hansa Yellow Light is quite opaque. After using Gamblin’s relief inks for a while, I intuitively know that yellow, napthol scarlet and titanium white will be the most opaque. Other inks like quinacridone red and phthalo blue will be very transparent. For me opacity means that it will cover up the color underneath more completely, and combine with it less. 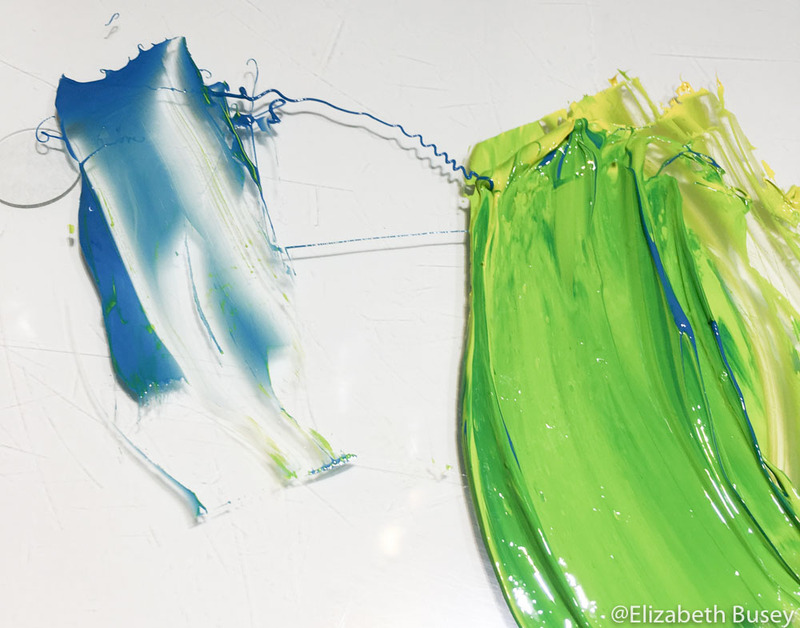 Even with opaque ink straight from the can, you will never get the color on the paper that you see on the glass. They aren’t completely opaque. I wanted to answer the question of why some inks were more opaque than others. It was remarkably difficult to get such an explanation without jumping off into a discussion of physics for which I was not qualified. Mixing in some transparent blue didn’t make my yellow much less opaque. Two on-line sources got me closer to an explanation of why inks vary in opacity. Why Some Paints are Transparent and Others Opaque, a page from Natural Pigments on-line store, has the most complete explanation. The Anatomy of Paint: Pigment and Binder from Essential Vermeer 2.0 has a discussion with a bit less physics. Remember that all pigments whether naturally gathered or industrially created all start out as a powder. 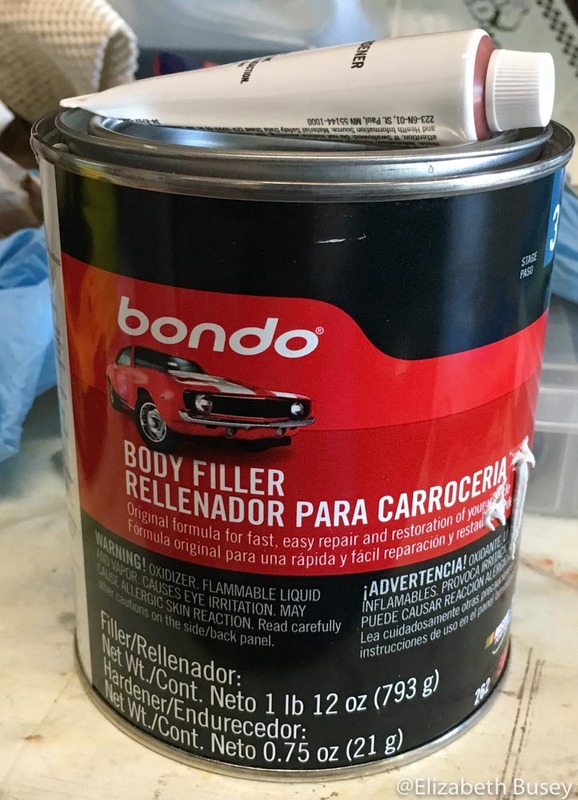 The powder is combined with a binder to allow the pigment to be applied to a surface. With printmaking, burnt plate oil (a heated version of linseed oil) is the binder. Both pigments and binders have a rating for their ability to refract — or scatter — light. The more similar the number, the more likely the created ink will be transparent — or not scattering the light. Linseed oil has an index of 1.479 so pigments that have a very similar index will allow the most light to pass through, appearing transparent. Other pigments like zinc oxide, have an index of 2.00, and therefore appear opaque — not allowing any of the light through. 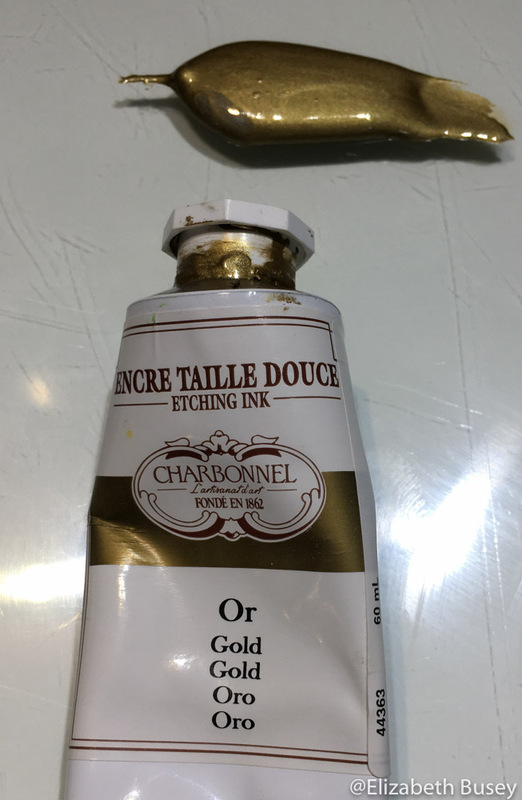 In my previous post on gold ink, I noted that my favorite one — Charbonnel’s Etching Ink Gold — had almost noticeable particles. 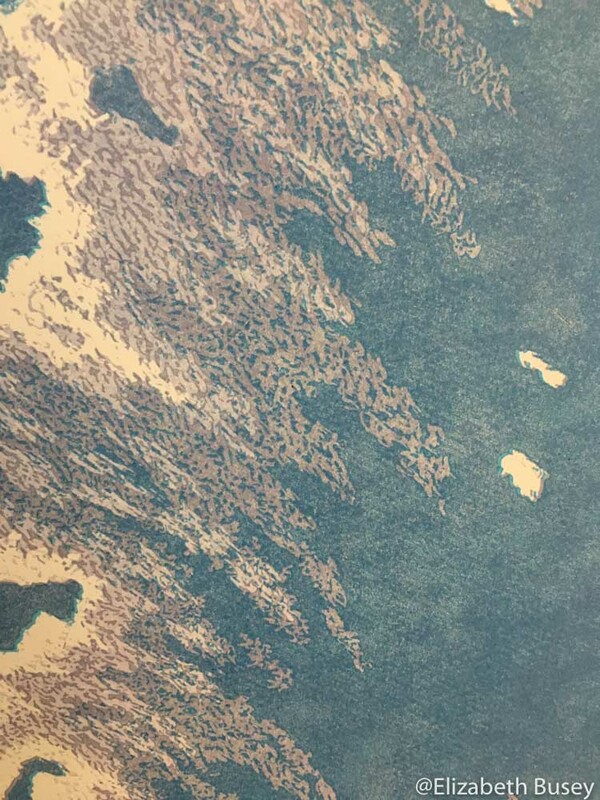 It is very opaque, and this makes sense because the light is being refracted off the (larger) gold pigment particles, and can’t make its way down through the ink layers to the white paper. Imagine all of those light particles struggling to make it through to the white paper! This variable is obvious to me, as I liberally mix transparent base into my relief inks to increase the transparency of any color. 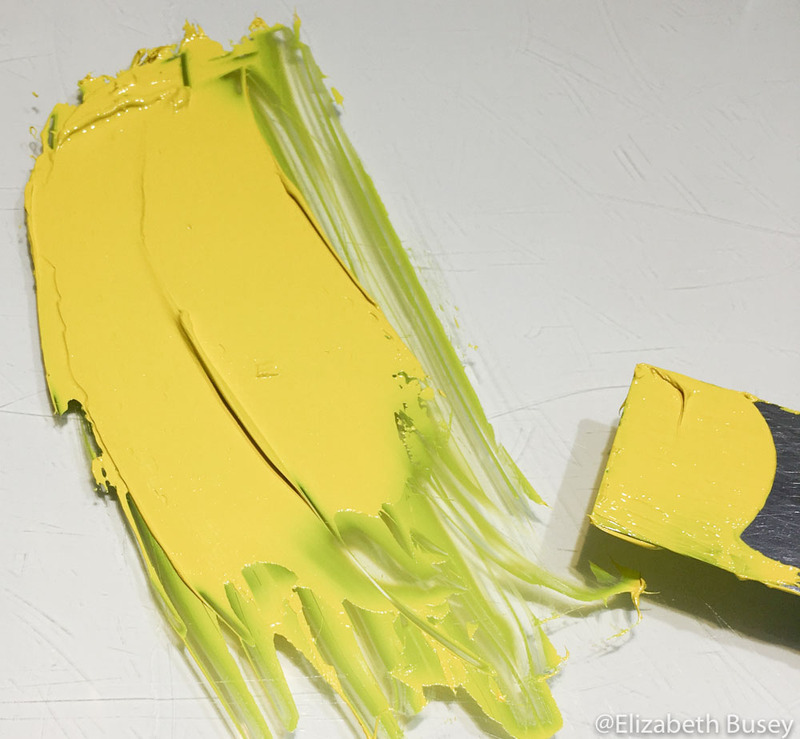 Even still, I can never achieve the transparency of a phthalo blue with the yellow or white inks. This is probably because of the above two variables. I’m not sure I completely understand refractive indicies, but I do get a kick out of imagining the light rays trying mightily to penetrate my layer of ink and make it to the white paper. Now back to my commission and to some new work. Science class is concluded. 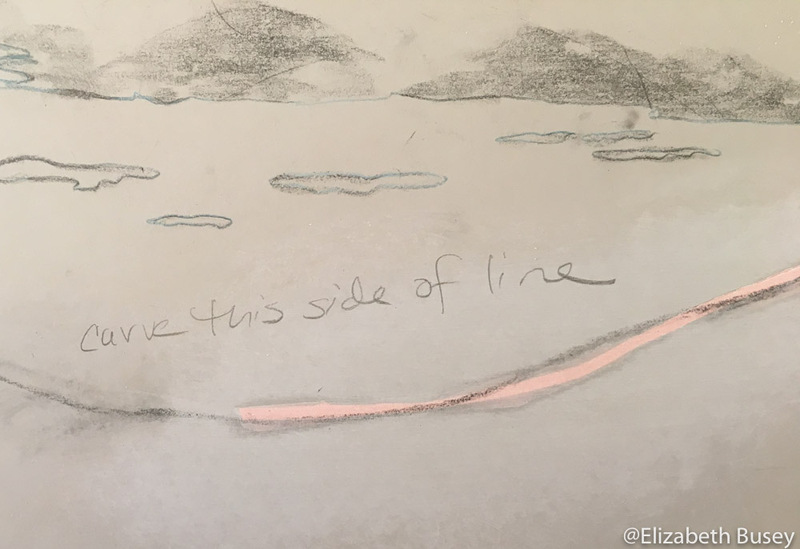 This entry was posted in Color Theory, Materials and tagged gamblin, ink, opacity, opaque, transparency on January 26, 2018 by Elizabeth Busey. Sometimes it is important to start small. I have a tendency to be impatient. I want to create an image on a LARGE scale. Unfortunately, I have some works that are large and problematic. If I had just taken the time to do a smaller study, I could have foreseen things that would go wrong later, but with much less heartache and with fewer sore muscles. This year’s eclipse has been on my creative mind for a while. I spent the event deep in the woods, watching crescent moons dance across a dry shale creek bed. I have been wanting to capture the feeling of this experience, and tried out a few ideas recently. A 9 x 12 inch study of eclipse moons on Thai Unryu paper. When looking my eclipse photographs, I noticed two things. First, the crescent moon shapes weren’t sharp, but rather were soft, and didn’t meet at points. Some were larger than others, some more complete. The variation came from the different pinholes made in the forest canopy as the light came down. I wondered if I might distinguish between the shapes with different transparent colors, even though my experience and my photographs were mostly black and white. Second, because it was not completely dark, you could see some of the tiny leaves and detritus that was on the creek bed. This provided some important 3D cues for the image. To address this issue, I decided to print on Thai Unryu paper. 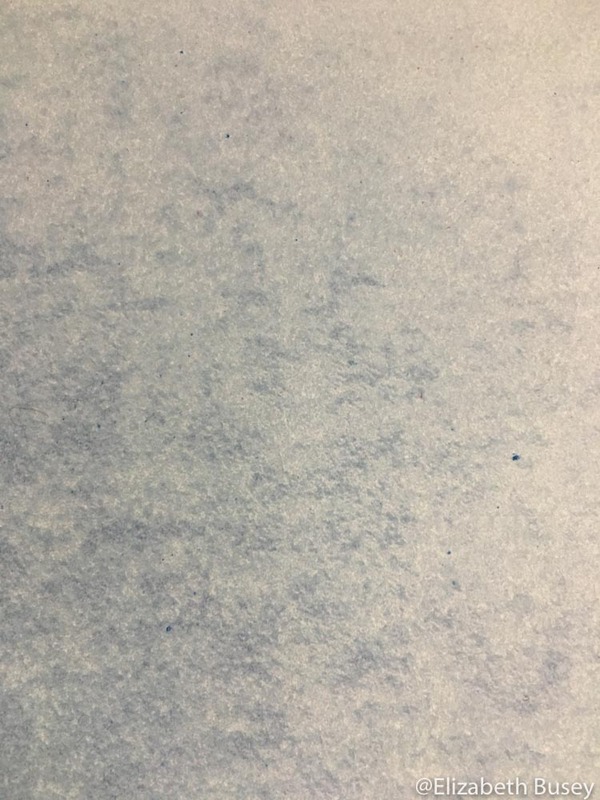 Sometimes called cloud paper, this is mulberry paper with thicker, longer fibers included. I wondered if the long fibers would show through in a way that might suggest the texture of the creek bed. Thai Unryu paper has longer fibers embedded in each sheet. 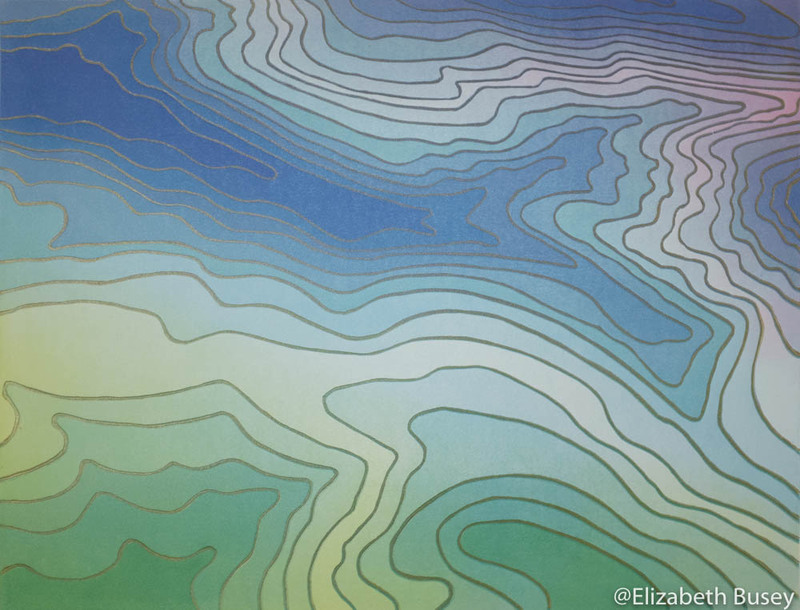 I’m glad I did this 9 x 12″ test print, because I think neither of these experiments was completely successful. Even while using very small changes in tone, the crescents separate in confusing ways. And when I printed the final darkest tones of the eclipse, the thin paper was completely saturated with pigment, and the long fibers are difficult to see. I think I will do something I haven’t done for a long time — create an image with only one color — perhaps with only two or three passes of the same color. I will stick with my trusty Rives BFK as well, as the Thai Unryu paper became saturated and began to stretch out of shape as I repeatedly printed on it. Learning on a smaller scale. It would be great if we could approach other things in life this way! 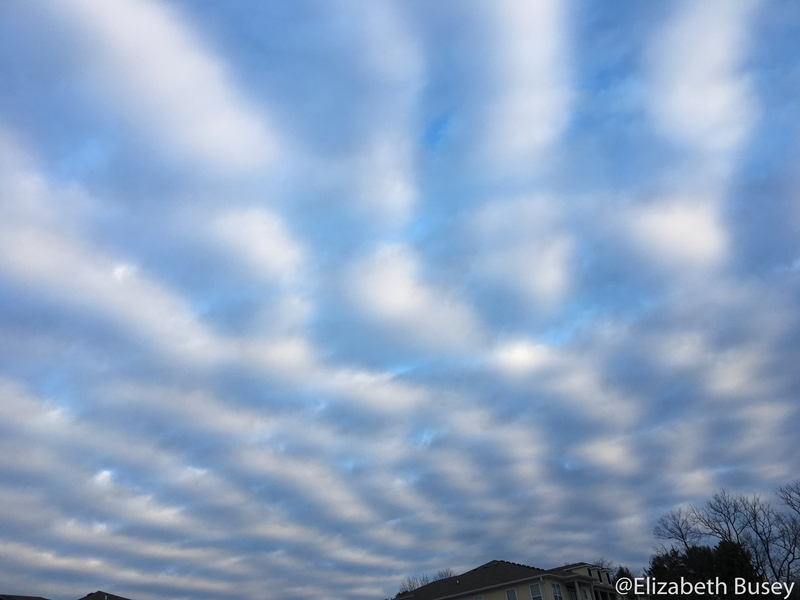 This entry was posted in Experimentation, Materials, Uncategorized and tagged eclipse, small scale, study, thai unryu on October 16, 2017 by Elizabeth Busey. Art-making is compromise. Those who say that you can make whatever you want are simply mistaken. Art making is a compromise between what you have in your imagination, and what you can accomplish with your materials. 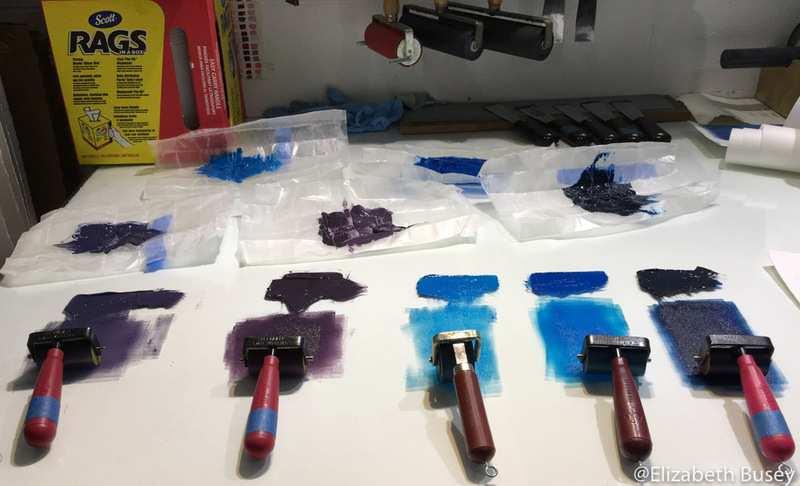 In reduction printmaking, this compromise has to do with the number of shades, colors or details you would like versus the amount of ink your paper is willing to accept. Apply too much ink, and you are finished. 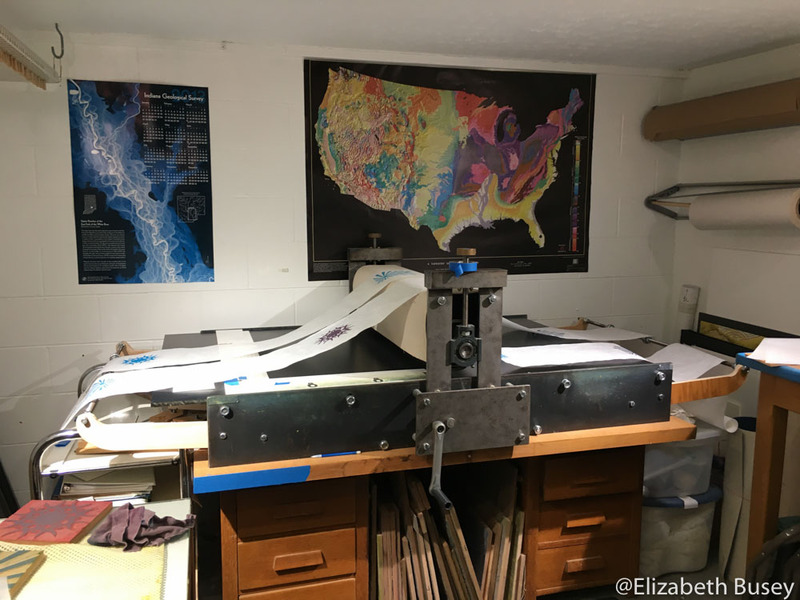 What is an overzealous printmaker to do? 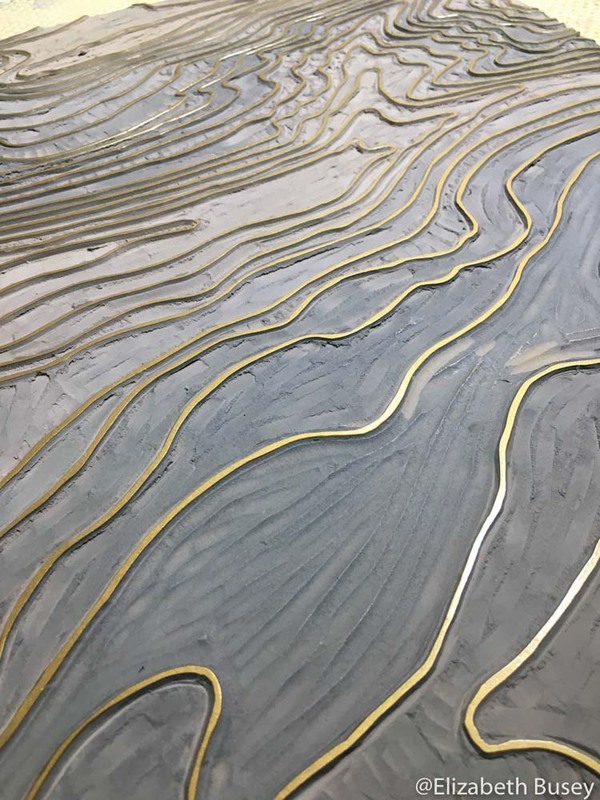 In many of my linocuts, I turn to metallic inks to finish the piece, even if I wasn’t quite finished myself. 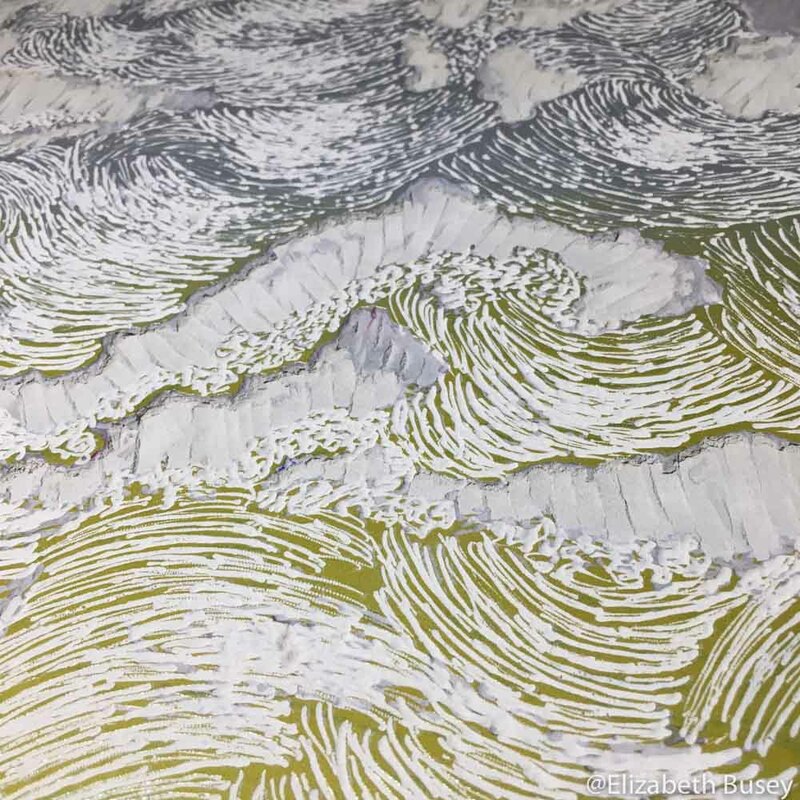 A blend roll of gold and silver metallic inks are the last layer on my latest cloud linocut. 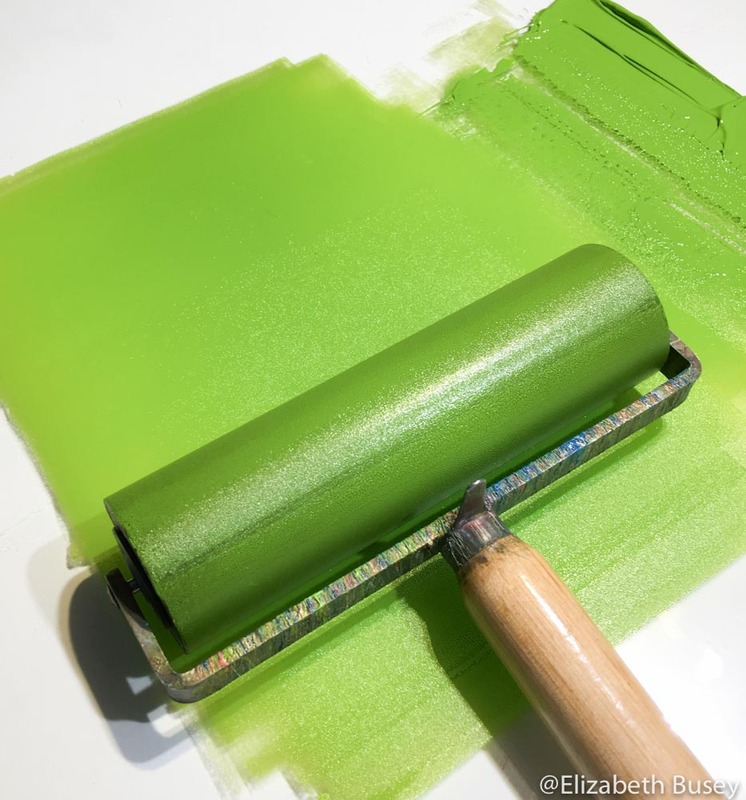 Metallic inks are different from other printmaking inks. 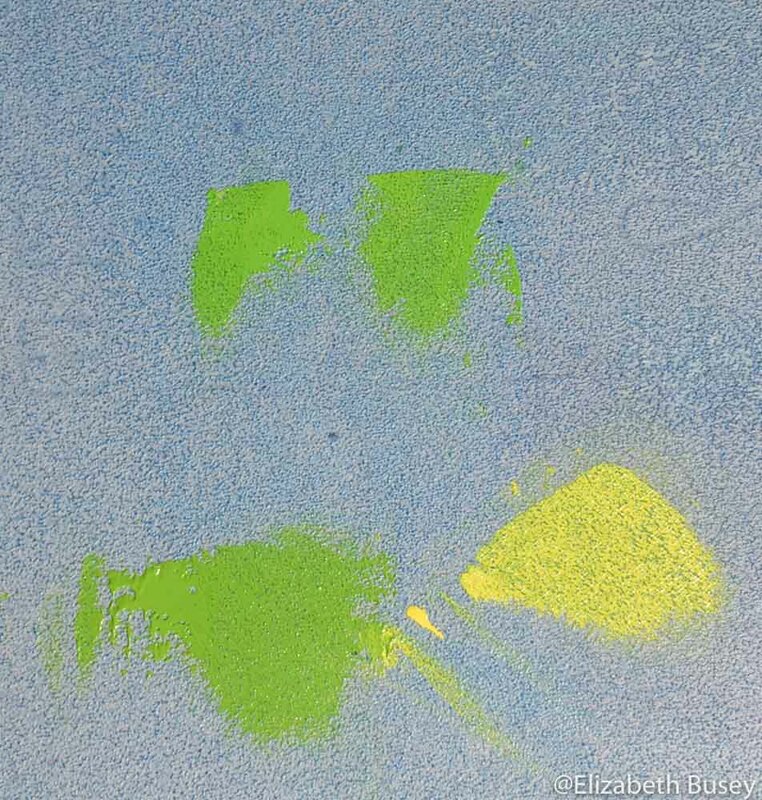 The pigments are not ground as finely as other colors so they can reflect light. 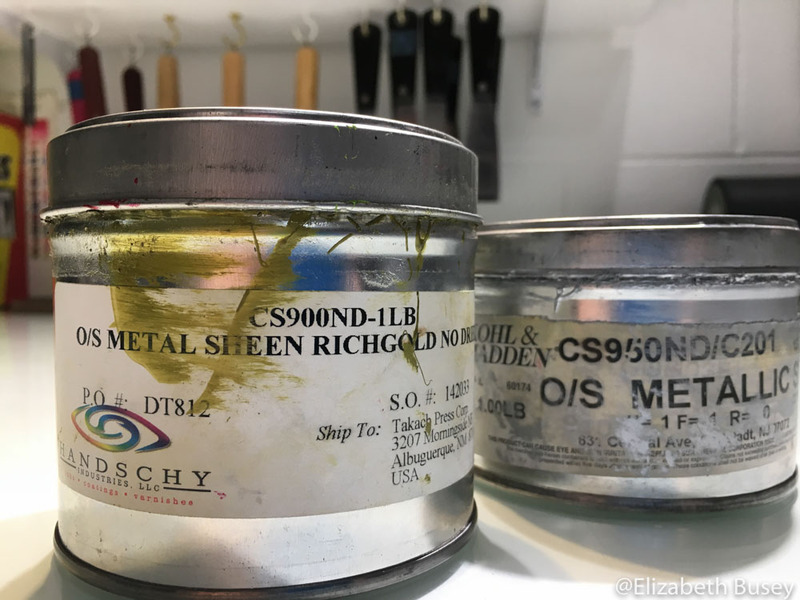 Gold inks are simulated with combinations of copper and zinc (yielding a sort of bronze) and silver inks are made from aluminum. As these inks dry, the metals rise to the surface. 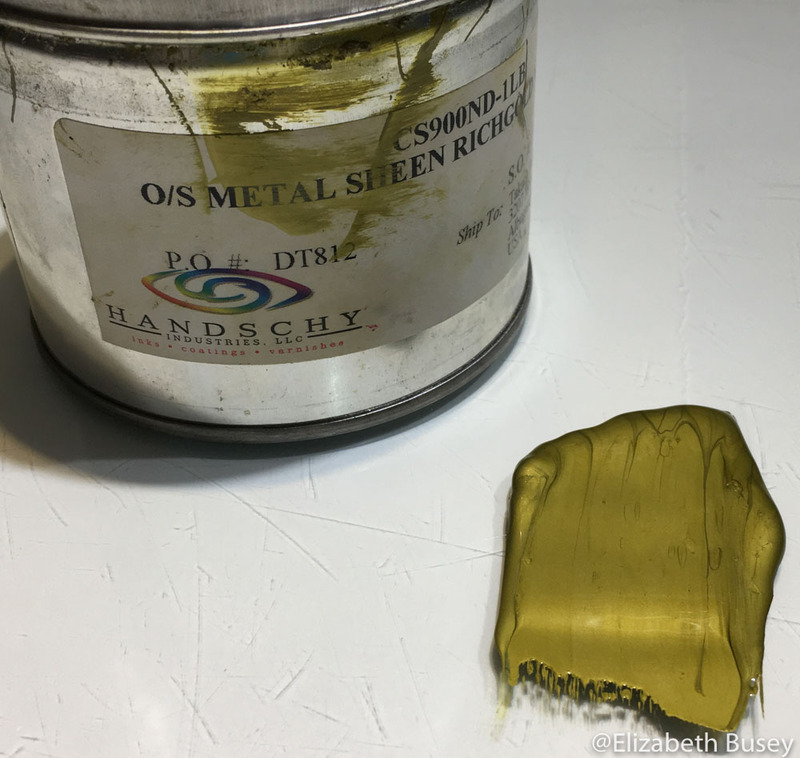 How shiny these pigments appear depends on the surface on which they are printed. On my very absorbent Rives BFK, the inks aren’t too shiny unless they are the last in a series of ink layers. With the above inked block, these inks are going over six other layers of ink, so the paper is nearly sealed. If you printed on a very slick surface, the results would be shinier. 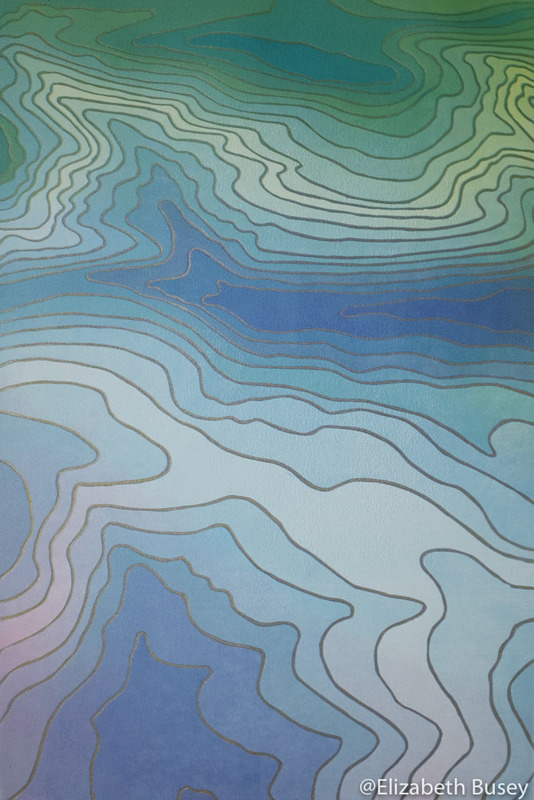 If a very reflective result is required, you would need to resort to foil printing — a fascinating technique with which I would love to experiment. Cans of metallic inks can bring a shine to any situation. 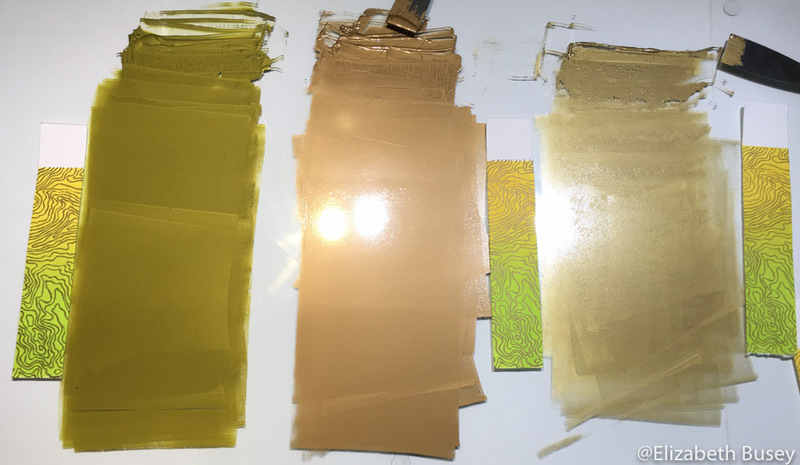 Gamblin –the maker of my other relief printmaking inks — does not make metallic inks. I have had my Handschy gold and Kohl & Madden silver inks for years. Straight out of the can they are very dark and strong, so I mix in some Gamblin Relief Transparent Base and some tack reducer to get the strength I need. So far my mixing of different ink brands has not resulted in a visit from the ink police. I also use a bit of metallic ink to make an ink less transparent, without adding white — which can lead to too-pastel colors. 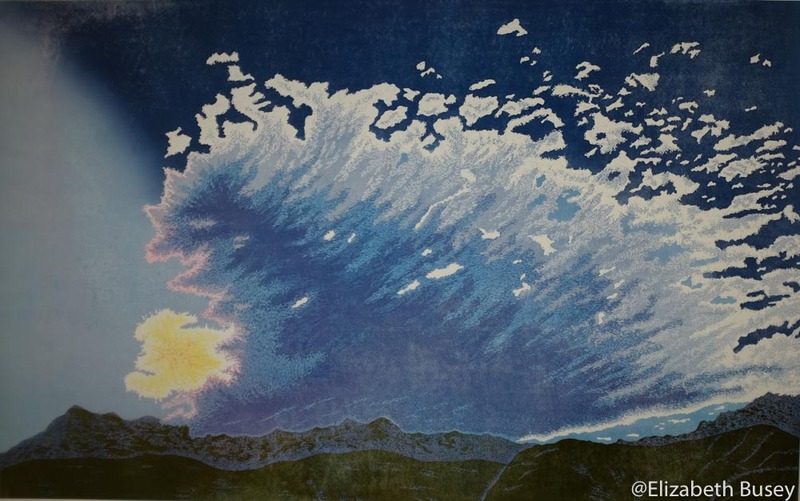 I just applied a layer of metallic gold and silver blend roll to my latest cloud linocut, and I think it is finished. It is a diptych, so I am working on just the right way to display it on-line. In the meantime, consider if a little metallic ink might help you put your shine on. 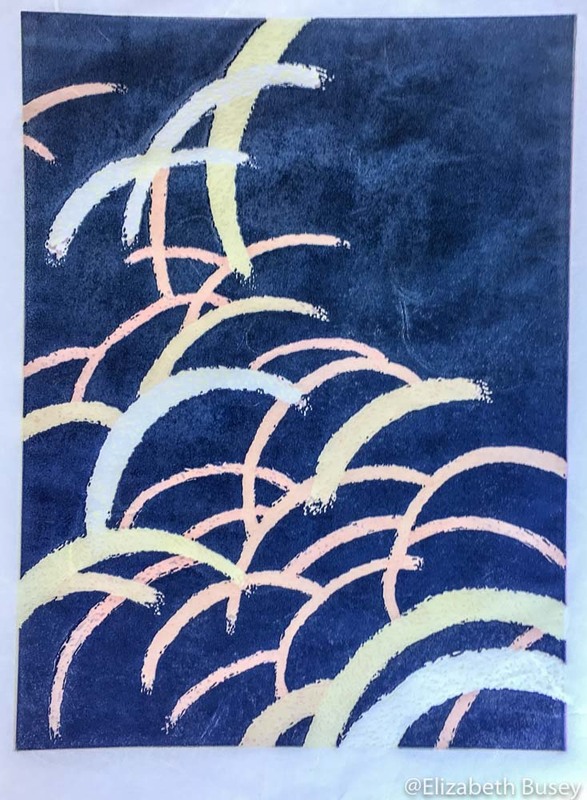 This entry was posted in Color Theory, Materials and tagged gamblin, Handschy, inks, Kohl & Madden, Linocut, metallic, printmaking on April 14, 2017 by Elizabeth Busey. One Thursday morning I was walking out of my rowing class and was treated to this site. 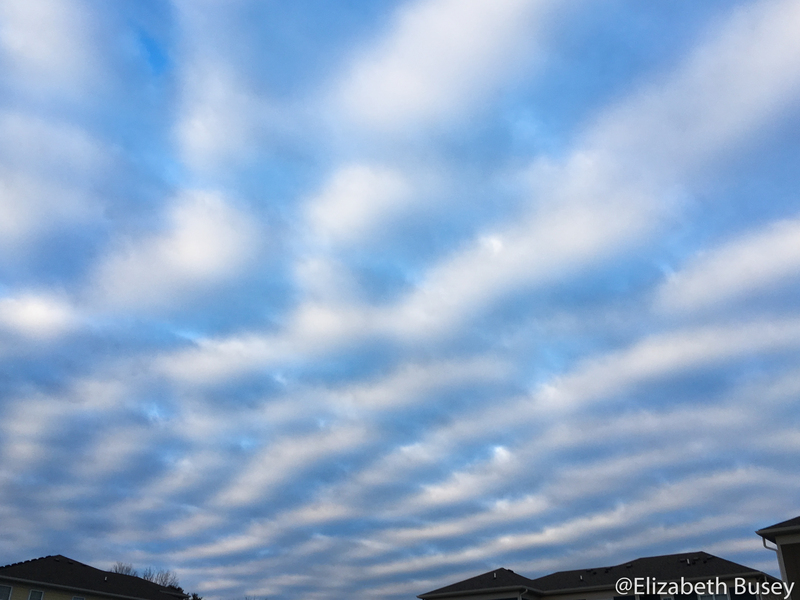 They are called altocumulus undulatus. I filled my phone with imagery from all angles. At home, I printed out some of these images on 11 x 17 inch photo paper so I could get a better sense of how the pattern would look if it was larger. Some patterns expand well, and others lose their appeal. From here I laid out all of the photographs and did some sketches, including some with colored pencils. Although I am not using the pencils in the exact layering technique that I will with my inks, the pencils do help me think about what colors are possible. 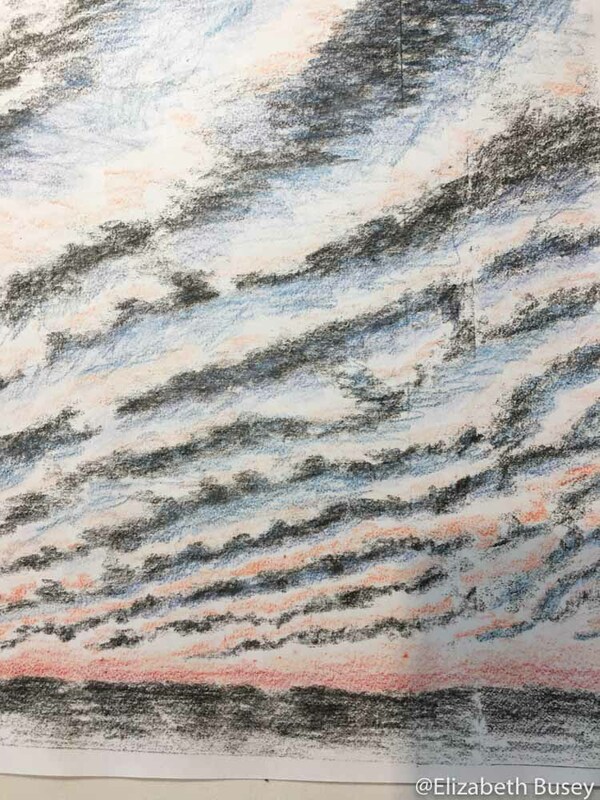 I love Prismacolor pencils for this task because they have rich pigments and blend together on the page. 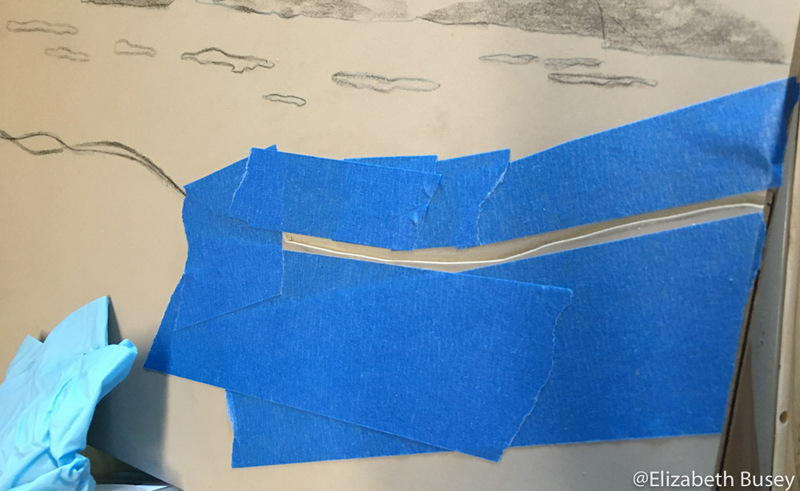 After I created a final drawing, I used a large sheet of tracing paper and an 8B pencil to create my own carbon copy. 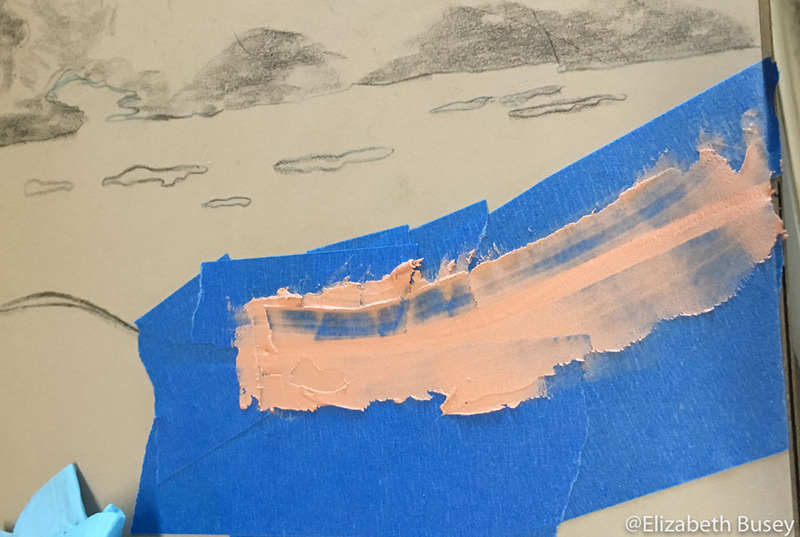 Here I’ve transferred the darkest part of the clouds, but I still have to judge which part will be the white area. If I carved away all of the areas that are without graphite, the linocut would have too much white and would appear only two-dimensional. 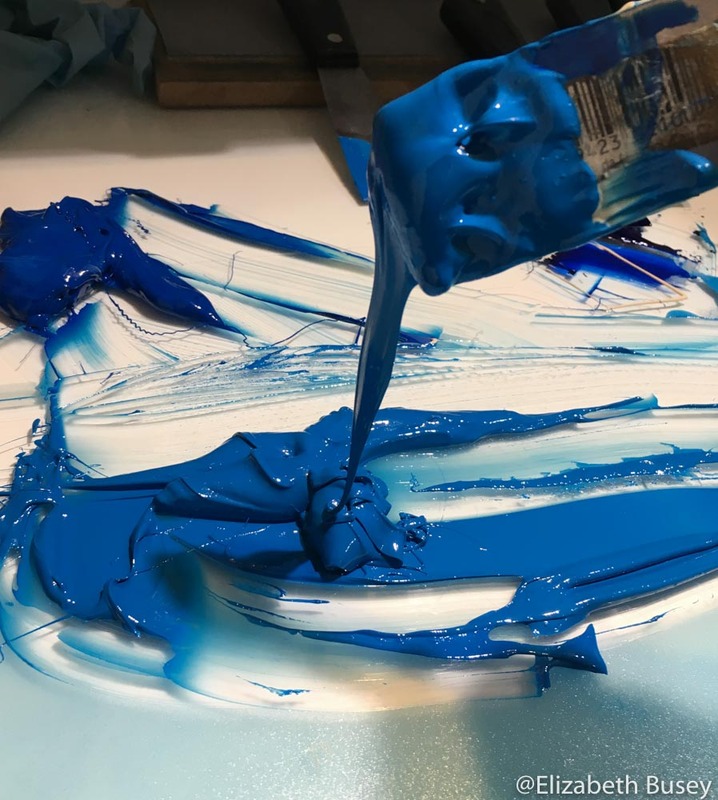 Pygmalion’s Art Supply in downtown Bloomington, IN has a new custom color created each year by their staff, and the proceeds from the pigment sales go to a local organization. I have just a bit left of last year’s Saffron, and use it with a touch of Red Rhino Red to create the glowing orange for the first layer. 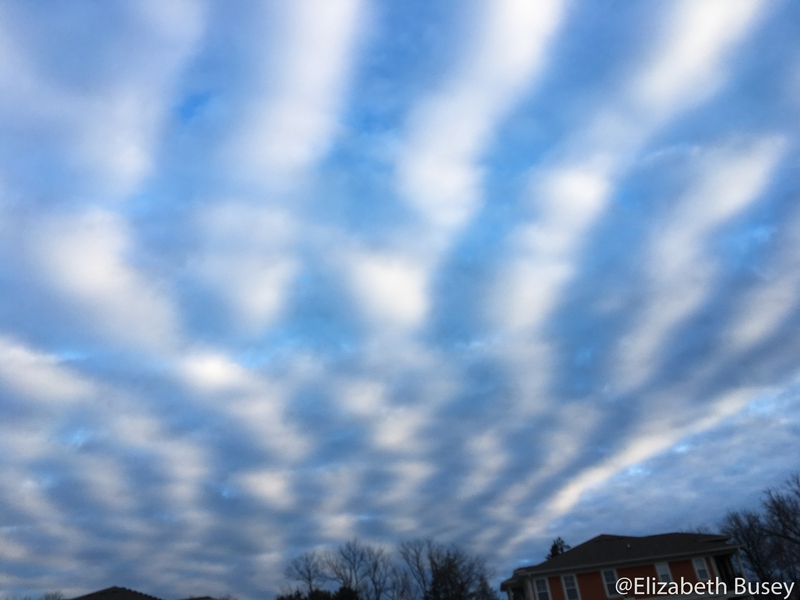 This entry was posted in Composition, Inspiration, Materials and tagged altocumulus undulatus, artmaking, beginning, ideas, Pygmalions Art Supply, Red Rhino Red on March 3, 2017 by Elizabeth Busey. I have done banners once before at First United Church. You can read about this installation at this blog post. As with any of my projects, I learned many things to do, and not to do, as the project progressed. I decided I needed to create some test banners before I began carving and printing my cloud-motif blocks. Because I will be using a more diaphanous paper than my usual Rives BFK, I knew I needed to test inks. 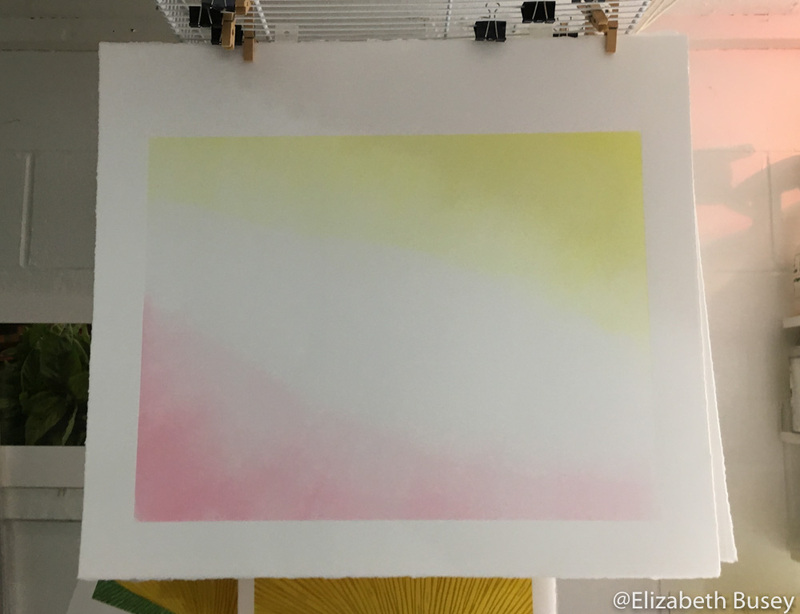 Luckily I had a selection of leftover inks, so I could test how different transparencies and chromatic intensities would look when printed on the paper and hung up. When light goes through the paper, the color can look washed out if it doesn’t have enough chroma. 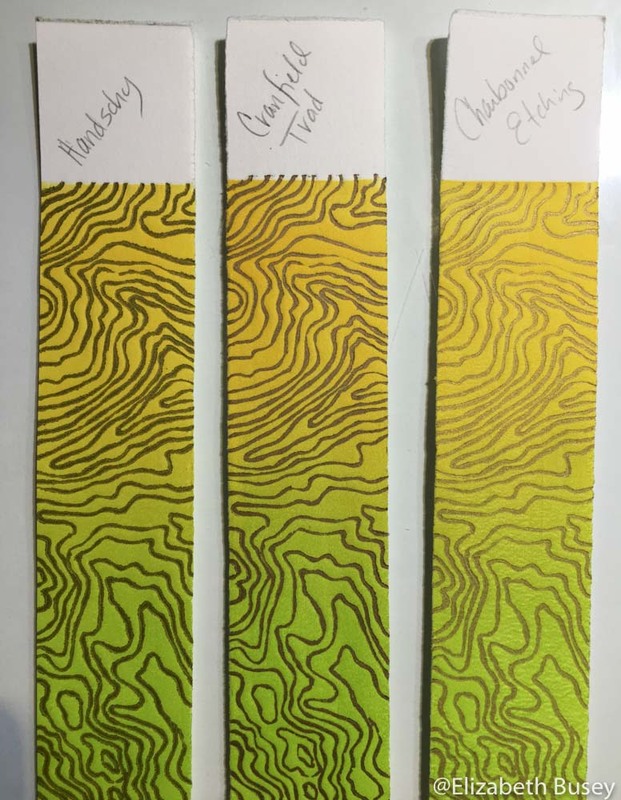 Sample inks and brayers, ready for the test. I laid out all of the leftover inks with my many small brayers. To act as a record for later, I drew a small amount of ink across some scrap paper with my putty knives. I think I learned that this technique was called a draw down. You squish a tiny roll of ink on paper with the putty knife. Papers were another variable I tested. 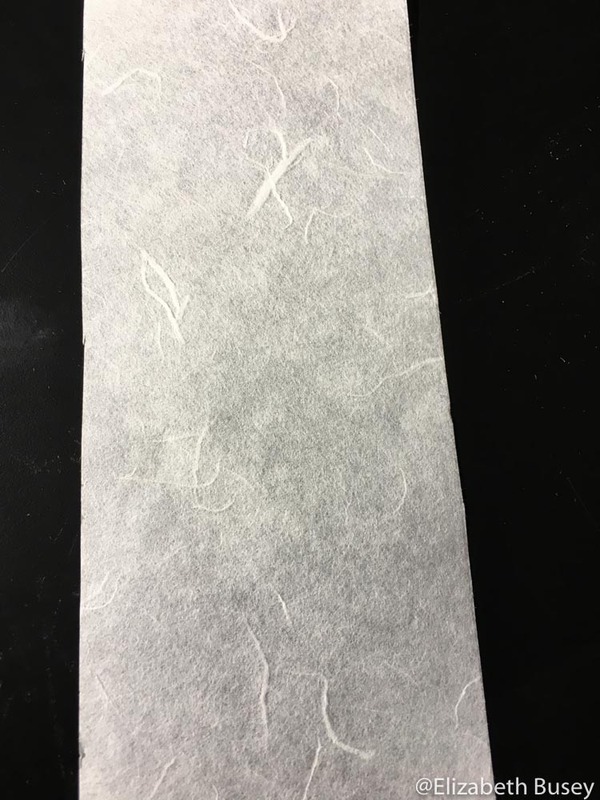 I tested both rolls of Kozo and Thai Unryu papers. Each paper has both a smooth and rough side, and I found I preferred the smooth side for my purposes. My previous banners were actually halved sheets of paper that were then joined in the middle. They wasn’t nearly long enough for this project, and I remember the taping process as extremely problematic. I initially thought I would have to print by hand with a spoon, but after doing this with two small blocks, I nixed the idea completely. I am addicted to my press. 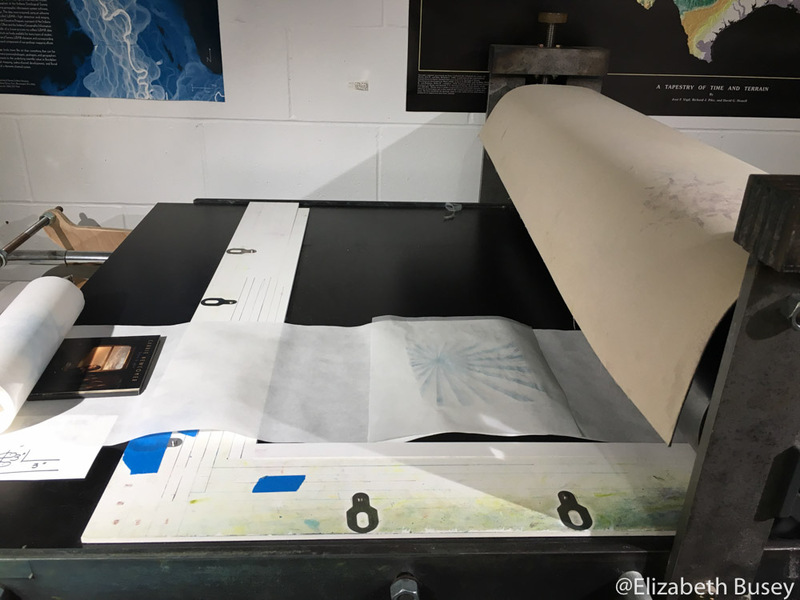 So I took a deep breath and had the exciting task of troubleshooting how to print on the long rolls of paper using my press. I used the two blocks from last summer’s Solar Flags project (read about that project here) in my experiment. Immediately I learned that I had to keep the paper rolled up at both ends, or it liked to creep below the press on either side of the bed and get crushed. Two Carrie Newcomer CDs from my studio playlist came in handy, and no, they do not go under the rollers. Keeping the other parts of the roll from sneaking under the press bed was challenging. I worried that the ink would smudge as it was gently rolled up, but it did not offset at all if I rolled up the paper loosely. 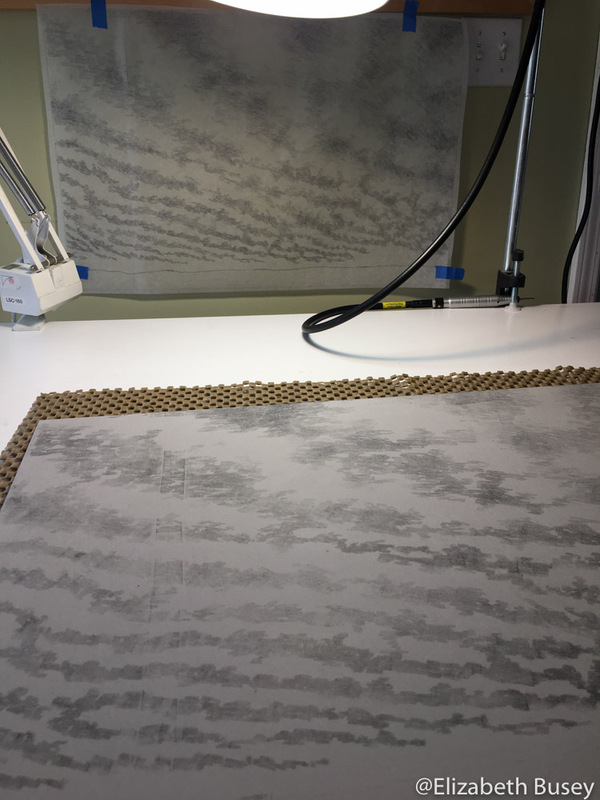 Certainly this process will not allow for any reduction printing, and all of the alignments will be approximate and fluid. Somehow this sounds appealing to me. Time to relax as my press bed becomes a drying rack. After printing five or six blocks on each banner, I unrolled the papers and let them dry completely over my press. The next day I put a dowel on the top with fishing line for hanging, and set off to climb a ridiculously tall ladder to hang up my tests. UPDATE: Sadly we did not get enough sign-ups for the class, so the installation was cancelled. I hope to find an installation opportunity in the future so I can use what I’ve learned. 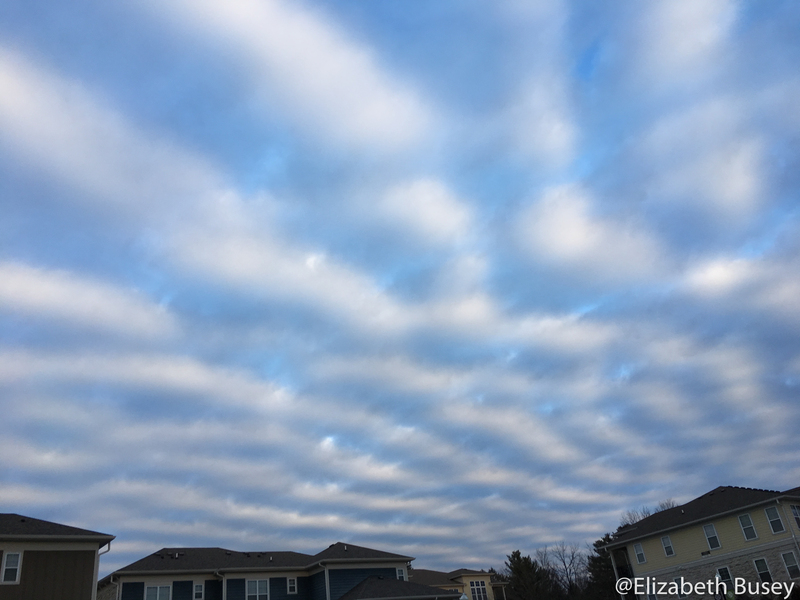 This entry was posted in Artistic Growth, Experimentation, Materials and tagged banner, collaboration, installation, Kozo, thai unryu, Women Writing for (a) Change on February 17, 2017 by Elizabeth Busey.